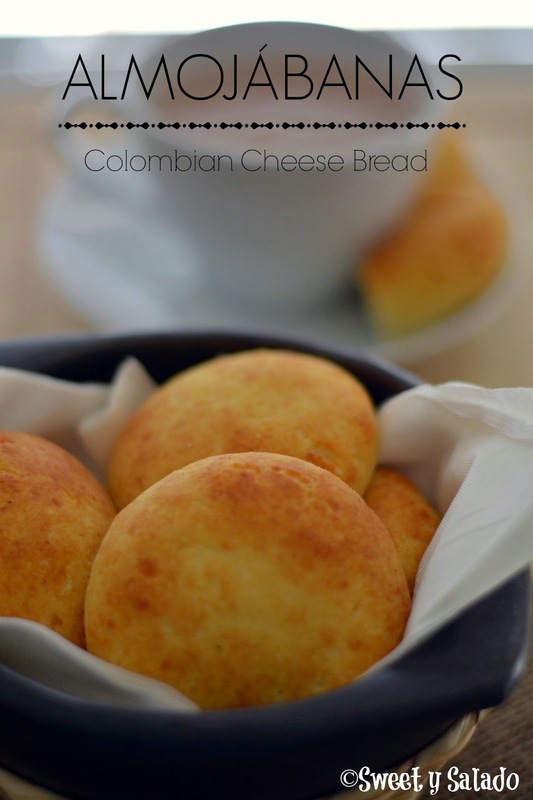 Another type of bread that is very popular in Colombia, especially in the region of Cundinamarca and Boyacá, are almojábanas, which is another kind of cheese bread, very similar to pandebonos and pandequesos. 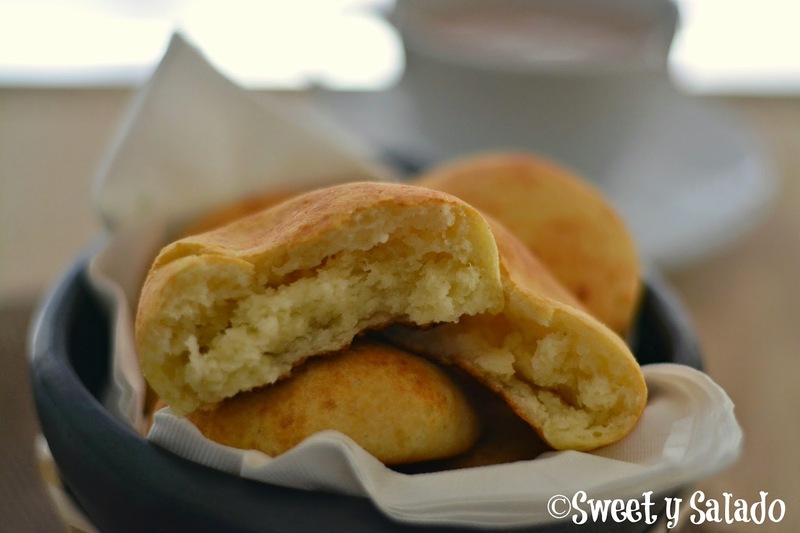 I shared the recipe to make pandebonos a while back which are mainly made with tapioca starch and costeño cheese. Almojábanas have a very similar texture but are mainly made with cuajada (another type of white cheese) and cornmeal (to make arepas). Every now and then I’ve seen a recipe where they also make them with tapioca starch, cornstarch and costeño cheese, but if you really think about it, with those ingredients you’re practically making pandebonos and not exactly almojábanas… just sayin’. And of course, making these almojábabas here in the US is a lot easier for me if I use queso fresco, a white Mexican cheese that I pretty much use on a daily basis. If you have the luxury of being able to find cuajada where you live, or the time to make it, all you have to do is let it dry so that it’s easier to grate. But, in all honesty, they come out just as delicious with the queso fresco. Many, many people wrote me requesting this recipe ever since I started the blog and I am finally able to share it with all of you. You’ll see that they are much easier to make than you thought and that there is no secret for them to come out with that gorgeous golden brown color and that beautiful spongy texture. Pre-heat oven at 450ºF (232ºC). In a large bowl, mix cornmeal, sugar, baking powder and salt. Then add the grated cheese and mix well. Now, add the beaten egg and start kneading with your hands. Finally, add a tbsp of milk at a time until you get a smooth dough. Divide dough into 10-12 equal portions, shape the almojábanas into small discs and place them on a baking sheet lined with parchment paper or a silicone baking mat. Bake for about 15-20 minutes or until golden brown. Let them cool for a few minutes and serve warm. Hi, I love your blog Ana YouTube Channel! It is amazing to be able to make food that I miss so much when I leave Colombia! Just a quick question, I tried making these but they were browning too quickly on the center bottom…what could it be? Hi there! It could be because your baking sheet was too thin and that usually lets the heat go through. If you don't have a thicker baking sheet, you can use two baking sheets, one under the other, to protect the almojábanas from burning. Also, if you're using dark baking sheets, they tend to absorb the heat longer, darkening the underside of most things you bake. Another thing you can try is position the baking sheet towards the top halfway through the baking process, just in case your oven is not distributing the heat evenly. Thank you so much for this recipe! I am Colombian and I live two hours away from a Colombian bakery, it's a treat when we go to eat there. Now I can make them at anytime. My whole family truly thanks you for sharing the recipe with all. Hi. 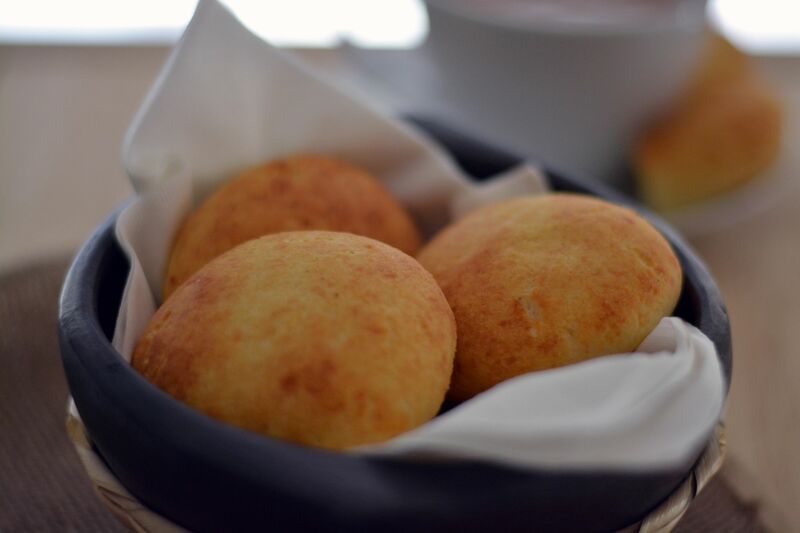 Is it possible to substitute mozzarella cheese for the queso fresco as you did in the pandebonos V.2 recipe? Hi, I have never made them with mozzarella cheese but you could try. I imagine the texture would be a bit different but not horrible. This is the first time I’ve left a comment on recipes. I lived in Colombia for a few years and miss the people and food. Tried this and it was very good. Thank you so much for sharing. I never thought it was so easy or would have been making them all along. The video was great!